For horse owners, horse health is of ultimate importance. Not only because you love your horse so much, but also because in most cases you expect him or her to be a performer - an athlete. Horses enjoy working with us if they trust us. Even if there are problems to work out, your horse will trust you if he has respect for you, not based on fear, but on your ability to be a good leader. Good leaders put the horse's interests first, they provide security and food, and in our domestic situations we must also provide an interesting life, and as profound an understanding of our horse's mental and physical state as we can develop. If we always ask only what they are able to give us, then they will give us their trust in return, a precious and beautiful gift. Horse health is a product of many different elements, each one as important as the next in forming the successful whole. Different situations will always require different solutions. (for practical examples go to the real remedies). It isn't necessary to sacrifice one area for another however, because the benefits of addressing all of the horses basic natural requirements always outweigh the perceived dangers. Often we damage our horse's health because we have not let go of fears and prejudices, or maybe aren't even aware of them, but with a bit of support we can enter a new world of understanding. Through Happy Horse Training, we want to provide that support by sharing our experiences based on twenty years of working with problem and rescue horses. 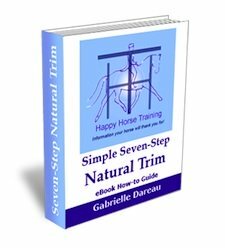 Often a problem which manifests itself under saddle is the result of something having gone wrong with one of these fundamental areas of your horse's health - for example a back problem - and it may never be possible to fix it at the training level. 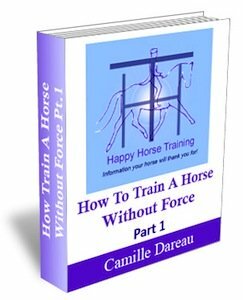 If each area is properly addressed, you will have a happy horse ready to train. Did you know that a tense horse cannot learn properly? Physically the muscles cannot develop, and mentally the horse's mind is not receptive. As well as a happy horse, we all want a safe horse, and safe horses are calm horses. When we ask a calm horse, that trusts us as his leader, to do something demanding such as loading him into a trailer or horse-box, we will be much more likely to avoid problems. See Loading a Horse for more on this. On an emotional level, horse behavior is very similar to our behavior. To see horses interacting in their natural state watch the amazing documentary Cloud: wild stallion of the Rockies. You will see how, like us, they have families and friends, and how important physical contact is to them. Playing and grooming and hanging around together keeps their minds healthy. This is because social contact is interesting, stimulating, and it also normalizes their behavior. In this environment they learn to react in acceptable ways to each other, in exactly the same way that we interact with our friends, family and work colleagues - as well as people we haven't met before. In these situations we moderate our behavior and make compromises and efforts for for each other. In return we receive support, love and camaraderie. Horses deprived of all of this in their lives (as millions of domestic horses are all over the world) are like people kept in solitary confinement. Their behavior becomes irrational and self-destructive, because they are bored and unstimulated, and most importantly they lose the loving contact of their own kind. For more information on the importance of a strong social structure for domestic horses go to the horse herd page. We can try to imagine our horses' world from their point of view. We can try to understand how much we limit their freedom with stables and fences. There are always solution if you are prepared to look for them and make them a priority. 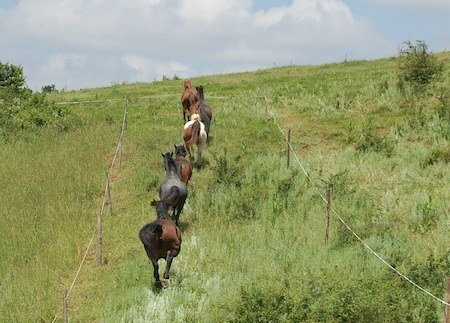 Not only can we provide our horses with an interesting social life, we can also make their environment more interesting. Well-known proponent of natural horse care Jamie Jackson has studied how wild horses use their environment and how it is possible to recreate this within the limits of domestic situations. Go to Paddock Paradise for more information, or read about our experience putting Paddock Paradise into practice. Remember that your horse can't pick up a book or turn on the TV. His diversion is physical and social. 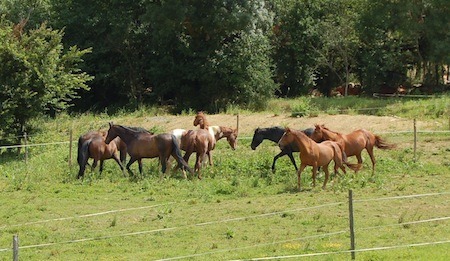 Horses have evolved for movement, and therefore movement heals them mentally and physically. Go to Understanding Horse Herd Dynamics for an account written by Naomi Sharpe, one of our previous working pupils, based on her observations of a horse herd in the US. The evolutionary path taken by horses means that they have developed a relatively specialized digestive system in response to particular environmental conditions. The issue we must address as horse owners is that the majority of horses are kept in a very different environment to that which would be suitable for their survival. Over time people have found answers to this problem, but unfortunately often the answer is short-term. Some of the most notorious dangers associated with horses and their care come about as a result, such as horse colic and laminitis, and can be avoided with a bit of open-minded action taking. Click on the link for advice on colic prevention. One of the most well understood characteristics of horses is their extremely long intestinal tract - 100 feet long, with a relatively small stomach. This system has evolved to process a fairly constant supply of low nutritional value, high-fiber forage. Addressing just this single horse health issue properly makes a huge difference, not just physically but also to the peace of mind of your horse. Go to horse diet in the hoof care section to find out its crucial importance for healthy hooves. Just as it is common to misunderstand the emotional complexity of the horse's mind, it is also easy to underestimate the presence of physical horse health problems. Especially likely when the lifestyle of the horse is compromised and performance is of such importance. In an ideal situation, holistic horse health means that lifestyle and nutrition are working well, thus providing a secure space for any physical health issues to arise and be addressed (click on the link for more information about the holistic horse care approach). However if horses are stressed and feel threatened, their powerful survival instinct will dissimulate certain injuries and blockages. This is not a resolution, and the sacrifice is often stiffness on the spinal level and rigidity in the joints. If you choose to begin a gymnastic suppling process with your horse, and you are prepared to allow your horse to live as a horse, not a kind of living machine, then for you and your horse, healing whatever injuries and traumas there may be is a great journey of discovery. World can open up for you that will entirely change your perspective.